June 14, 2017 - one year ago that my beautiful mom earned her wings!! I did not think it would be so hard - since I guess I thought I was handling it great this past year. However, was I ever so wrong. The pain is there just as if it was happening today! I look at your pictures, see your smile and I feel a piece of my heart has been taken away. 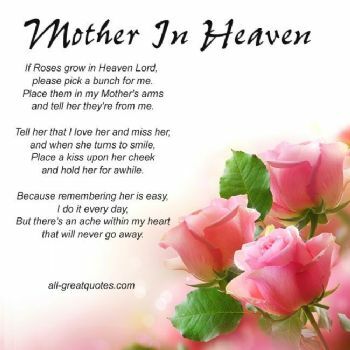 Mom - I know and understand you are finally at peace, pain free and enjoying Your granddaughter (my other angel) in heaven! This is for you! Mom you were a women like no other! but most importantly you loved me unconditionally!! an influence she continues to be in my life!! MOTHER!! I LOVE YOU TODAY AND ALWAYS! Wonderful tribute to a wonderful Mom. Losing Mom is hard, I still miss mine & it's been about 4 yrs. When she was feeling good she'd call every day but after Dad passed I think she just missed him a lot & just kind of faded away . Mom's are special ! Your mom sounds like she was a very positive influence on you. Losing our moms always leaves a big void in our lives. Hang on to all the good memories. Hope you find some comfort in your memories of her. My grandma passed away 4 years ago on June 14.